Commentary on the Book of the Kings of Truth (Hashieh bar Haqq ol-Haqayeq, 1967) contains explanations of certain terms and expressions used in the epic The Book of the Kings of Truth (Shahnameh-ye Haqiqat) by Hadj Nematollah Mokri Jeyhunabadi, Ostad Elahi’s father. Composed in the span of 40 days, Ostad Elahi recounts how his father paced across the room and dictated the 15,000 verses of this epic while he rapidly transcribed them. The Book of the Kings of Truth relays the spiritual history of religions, the biographies and ranks of prophets and saints as well as prominent figures in the history of humanity, all from the unique perspective of Hadj Nematollah and his emphasis on the purpose of the universe and the process of spiritual perfection of beings. The work describes, particularly through the accounts of the successive manifestations of the divine Essence and His representatives, how they came into being in each era for the purpose of guiding humanity. In the last section, Hadj Nematollah alludes to his own spiritual calling as well. 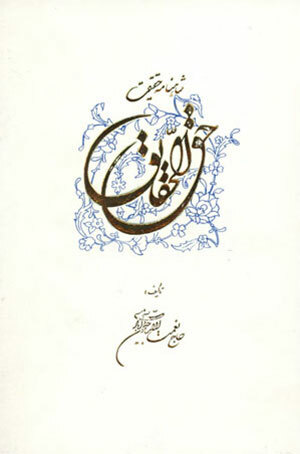 Ostad Elahi also explains and sheds new light on the meaning of some of the complex terminology and poetic interpretations of his father’s work, including apparent ambiguities regarding historical events, the concept of divine manifestation, and in general the paradoxes that might be perceived throughout the text. The Commentary emphasizes that overall The Book of the Kings of Truth is not a compilation of legends, but rather is predicated on allegorical spiritual realities. In general, from the Creator’s point of view, the various levels of creation are akin to different colors (whether white, black, green, red, blue, yellow, etc. ), each of which exists on the same plane and occupies a uniform rank. The combination of these colors, however, results in the formation of a variety of color schemes and paintings that will each have a unique quality and effect upon the observer. . . . Similarly, if a certain medicine tastes bitter and unpleasant to a sick person and a lethal poison were to hypothetically taste sweet and delicious, the patient’s sense of taste cannot form the basis for a reliable and informed diagnosis. Moreover, if there are disparities in the value of things based on human tastes and conventions (gold, silver, copper, iron, precious stones, ordinary rocks, etc. ), those valuations are nonessential considerations, for such things are inherently equal in terms of their nature and properties. That is why there are certain things that can be accomplished with iron, copper, and ordinary rocks, for instance, that cannot be achieved with gold, silver, or gems. And this holds true for the rest of creation as well. Accordingly, if certain factors—such as heredity, nutrition, environment, impulses of the imperious self, circumstances of a given time and place, etc.—cause a person to commit an act or acts that are contrary to religious and ethical prescriptions, to the dictates of one’s conscience, or to social norms and rational considerations, such an act is unrelated to the original essence of one’s substance or primordial nature and should not lead to the erroneous implication of the issue of determinism and free will. In clearer terms, God Almighty, Creator of all creatures and Artisan and Possessor of all beings, has never created evil in any of His creation such that evil actions could be attributed to the inherent nature of His creation. Based on this principle, the cause of any malevolent act or acts arising from an agent should be sought not in divine providence or in the origin of creation, but rather in the above-mentioned factors and the pursuit of the impulses of the imperious self. Therefore, if the aforementioned tenebrous and igneous spirits . . . conform to the purpose for which they were created, they will never give rise to any harmful or undesirable consequences. Just as a sharp tool can be used for legitimate ends—for instance, to operate on a patient’s organs or to remove necrotic tissue—it can likewise be used to intentionally commit reprehensible acts such as the murder of an innocent being. In either case, the action of the agent has no relation to that of the Divine Artisan. We have often reiterated that the whole universe and the creation of all beings rest on the principle of causality. At the same time, science has also established that objects and beings come into existence through the interaction of two opposite natures, or though negative and positive poles. . . . In accordance with the providential laws of nature, human beings were formed from the positive and negative poles of light and darkness, or, in other words, from ‘yellow clay’ and ‘black clay,’ respectively. Now, just as contrast is required through the use of opposite colors (for example, white and black) for a drawing to be visible on paper, or just as the interaction of positive and negative wires is necessary to generate electricity, as long as the transparent and subtle spirit does not merge with the dense and turbid body there will not be any life or perception. Consequently, the imagery of ‘yellow clay’ is analogous to the immaterial, divine spirit that originates from the celestial realm or the realm of Dominion, while the imagery of ‘black clay’ is analogous to the passionate imperious self, which originates from matter and forms the physical world or the realm of Kingdom. Their union results not only in the genesis of life and perception, but also in the origin of the positive or negative actions of humanity.